There are a plethora of popular onsen and bathing resorts that can make a great day trip from Osaka. Choose from large spas, private family baths, konyoku (mixed-gender) onsen and more! Arima Onsen is one of Japan's most famous onsen retreats, where you can enjoy both their so-called Kinsen (Golden) and Ginsen (Silver) hot springs. 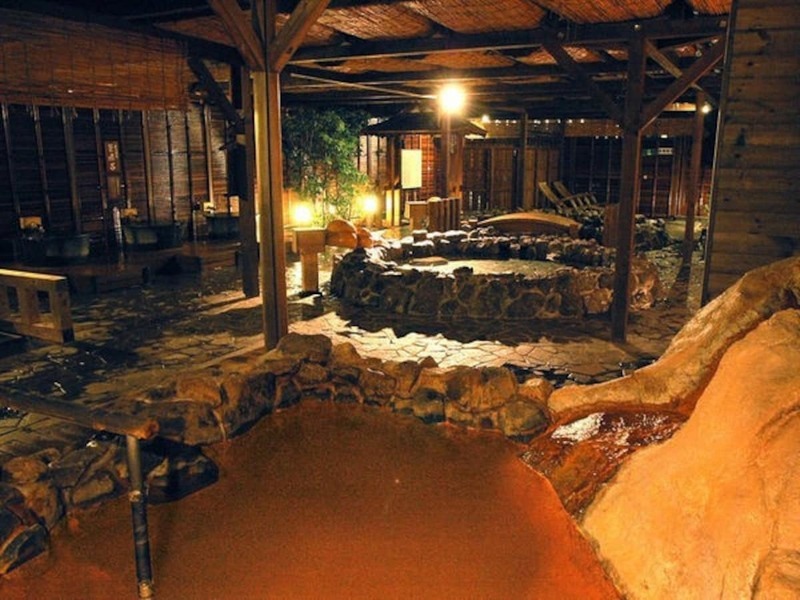 The Taiko-no-Yu retreat has plentiful carbonic and herbal baths with therapeutic effects, including iwaburo onsen made of rocks and cauldron baths known as a goemonburo. Okumizuma Onsen is a natural hot spring surrounded by the scenic valleys and mountain streams of Mount Izumi Katsuragi. Water from this dense sodium spring is actually potable, and is said to have so many therapeutic effects that it's also known as "Kiseki no Yu," the Water of Miracles. The largest onsen theme park in western Japan, Mino Onsen Spa Garden has even been ranked number one on the Jalan travel site ranking—and though it's admittedly dropped in recent years, the baths themselves are still highly ranked. Its sodium bicarbonate saline springs and chloride springs in particular are known for making the skin smooth and beautiful. Considered by some to be among the best in Osaka, the simple thermal springs at Kamigata Onsen Ikkyu contain a well-balanced variety of minerals. All the baths are 100 percent natural, with water continuously flowing in from the source. It's a great stop on the way back from Universal Studios Japan! Rurikei Onsen is a holiday resort equipped with hot springs, a swimming pool and facilities for outdoor leisure and barbecues, as well as a mixed-gender onsen for women and men to enjoy together. There's also a bathing area where you can wear a swimsuit, which you can even rent on-site. Amami Onsen Nanten-en is an onsen ryokan (traditional inn) with charming architecture designed by Tatsuno Kingo, a renowned architect of the Meiji (1868-1912) and Taisho Periods (1912-1926). It takes about 40 minutes from Osaka to get to the area by train, after which the ryokan is conviently located a two-minute walk from the station, making it the perfect destination for a day trip as well as an overnight stay. Osaka Sansuikan is an onsen resort that takes pride both in its therapeutic effects and its location by the Settsukyo Gorge. Enjoy cherry blossoms in the spring, fireflies and swimming in the river in the summer, and beautiful foliage in the fall. Sister ryokan Bijinyu Syofuen also has a family bath with a stone sauna. 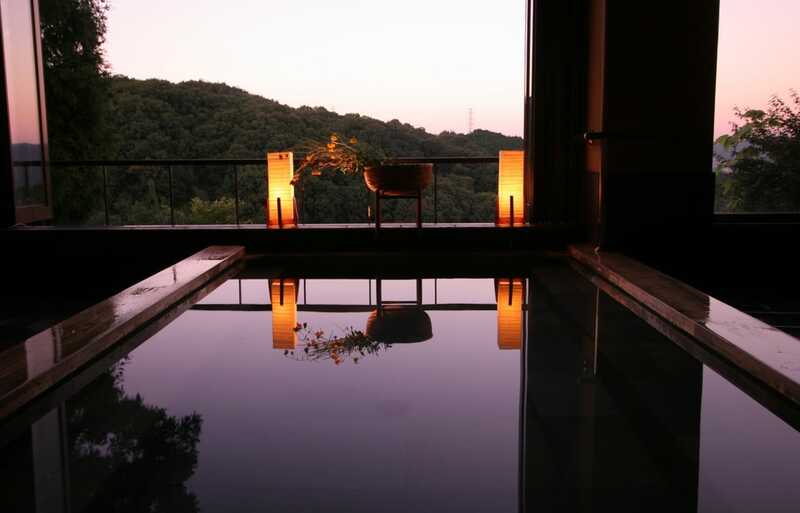 Kakimotoya is an inn hidden in the depths of Mount Shigi in Nara Prefecture, affording a magical view from any of the rooms equipped with open-air baths, or rotenburo. Carefully prepared multi-course kaiseki cuisine and gorgeous nature are sure to nourish both your body and soul. Hounoya is a natural onsen located in Naka-senbon in the World Heritage Site of Yoshinoyama. The open-air bath (rotenburo) offers a panoramic view of Yoshinoyama's cherry blossoms in spring and magical changing leaves in fall. The view of the Kongo-Ikoma-Kisen Quasi-National Park from the rooms is breathtaking. Fushioukaku Hot Springs Hotel is an onsen resort 30 minutes from Osaka by train or car. There are 20 rooms with open-air baths, and a banquet room and meeting facilities are also available. Swimming pools and a barbecue garden are available for use in the summer. Kansai Airport Spa Hotel Garden Palace has a large bath that can be reserved for one hour at a time from 10 a.m. to 3 p.m., predominantly by day visitors. Recommended for couples and families. This resort consists of a number of separate cottages available to be rented out by guests, with each room equipped with a half-open-air bath. The facility is located within a five-minute walking distance of Takedao Station. Enjoy botan nabe (wild boar stew), Sanda beef shabu-shabu (hot pot), and multi-course kaiseki cuisine created by renowned contemporary chef Toshiro Kandagawa. Want to know more about hot springs in Japan? We've got over 150 great articles right here in our Onsen Special!